From the Latin for brother the ‘friars’ of the Carmelite Order began not as a religious order but as a small band of mostly lay people who came together and formed a community on the slopes of Mount Carmel in the Holy Land at the beginning of the thirteenth century. Over the centuries many people have felt called to Carmel, some as religious friars or nuns others as lay people. Today most though not all friars are ordained priests but the identity as ‘brother’ remains the most fundamental aspect of a Carmelite friar’s vocation. Unlike monks who live in largely enclosed monasteries often in remote places, the notion of being ‘in the midst of the people’ is very important for the friars’ way of life. The material support of friars is also different from that of monks who historically live off their own farm produce or from renting out land. The Carmelite friars, however, are a mendicant order depending entirely on the providence of God in the form of the charitable support of the people they serve. The Carmelite Family is made up of different organisational branches which share a uniting spirit or ‘charism’. The two main branches are the ‘Ancient’ and the ‘Teresian’ Observances. They differ only in small matters of emphasis.An image depicting the crests traditionally associated with the Ancient Observance (left) and the Discalced Observance (right), united around Christ and his mother. The Ancient Observance – O.Carm is the oldest branch of the Carmelite Family. The crest of this branch does not have a cross at the summit of the mountain. 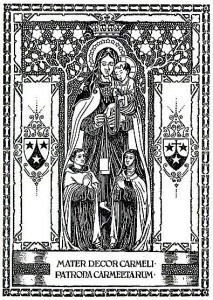 The Discalced Carmelites – OCD (Ordo Carmelitarum Discalceatorum) or Teresian differ in that they follow the reforms of the Carmelite Order made by Saint Teresa of Jesus (of Avila) in the sixteenth century. One such reform is the wearing of sandals, no uppers to the shoe -‘shoeless’ – discalced, a sign of poverty and reform. 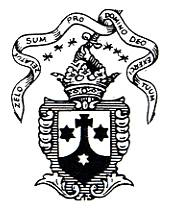 The crest of the OCD Carmelites uniquely features a cross at the summit of the mountain. It is the largest branch of the Carmelite Family today and is present worldwide.